We’d love your help. Let us know what’s wrong with this preview of 四月は君の嘘 1 by Naoshi Arakawa. To ask other readers questions about 四月は君の嘘 1, please sign up. You know, even without the music, this was a beautiful first installment of "Your lie in April" The anime was excellent, and I was eager to get started on the manga. Firstly, I love that this manga is entirely centred around music, and being a musician. As I am a musician myself, I think that definitely had something to do with it. This story is so much more than romance. It is about building friendships, hope, and following your dreams. The characters are wonderful and there is a real sense of s You know, even without the music, this was a beautiful first installment of "Your lie in April" The anime was excellent, and I was eager to get started on the manga. Firstly, I love that this manga is entirely centred around music, and being a musician. As I am a musician myself, I think that definitely had something to do with it. This story is so much more than romance. It is about building friendships, hope, and following your dreams. The characters are wonderful and there is a real sense of solid, friendships forming. Your Lie in April - I saw the anime first... then I read all the manga. I LOVED it SO MUCH... and I cried a lot too!!! It was deep... and as life changing as a first, true love can be. I really liked the main characters, they have a spot in my heart. This rating and review are for all of the published volumes. This manga started out with quite a cliche about music and youth-loves concerning a piano prodigy who traumatized by the memory of his late mother abuse, his two--male and female--childhood friends, and a happy-go-lucky violonist who fell in love with the male bestfriend. At first sight, this seems like your usual rectangular-love, but actually, I think there's not even a slight hints of romance here but admirations and comforting relat This rating and review are for all of the published volumes. This manga started out with quite a cliche about music and youth-loves concerning a piano prodigy who traumatized by the memory of his late mother abuse, his two--male and female--childhood friends, and a happy-go-lucky violonist who fell in love with the male bestfriend. At first sight, this seems like your usual rectangular-love, but actually, I think there's not even a slight hints of romance here but admirations and comforting relationship. Arima Kousei stopped playing piano when his mother died two years ago, declaring that he couldn't hear the piano's voice anymore. A chance brought him to a somewhat double date with his two childhood friends, Tsubaki and Watari, and a girl in Tsubaki's class who fell in love with Watari. Arima's first meeting with Kao, the girl who fell in love with Watari, was when she's standing atop of a playground and playing music with resident kids. Turned out, she was a violinist, and that double date ended up with the three of them watching her competition performance. After such an unlikely performance, Kao was up to the final round, and she then asked--forced--Kousei to be her piano accompanist, leaving Arima facing his greatest fears: piano, and his mother's memory. For such a story with somewhat a predictable premise, this manga offer a different perspective toward music and any competitive ground, about ups and downs, despair and pride, and future dream careers. Anyone struggles reaching their dreams who ever feel the anxieties of being successful or a failure could easily sympathize with these characters. It also showed us about the effect of strict teaching parents and it's argument. I really like how the mangaka tackle all of the issues thrown in the story with multiple perspectives, made the characters grow in more way than one. I personally love how Arakawa-sensei decides to deliver this story. It's new, with Kao's true motivation in invited Watari, Tsubaki, and Arima into double date being pushed until the very last chapter, bringing this melancholic aura keeps getting strong even till the very last chapter. If Arakawa-sensei put Kao's story in few first chapter, I bet this story would fall flat and cliche, but put it in the very back, it delivers such powerful feelings instead. So kudos for the great story execution. I just wish there would be more of Watari, though. He actually got a great personality, so it's a shame that his role is just as Arima's source-of-envy. Even Takeshi Aiza got his character development, but Watari got nothing eventhough he's Arima's most loyal mental and moral supporter. Lovely story with great characters and a whole lot of heart! Can’t wait to continue with the series! Quite poetic, very lovely story. I look forward to more! Ay qué lindos por favor. Such a promising start to a series! This was so simple and cute, with minimal fuss but jam packed full of feels! This series is rated Teen and deals hardships including death and also has a little violence so consider these things before reading it but know at least from the 1st volume I believe there might be hope later on in the series. I'll be honest I wasn't 100% sure about a "musical" manga but I will admit my preconceived notions about a manga based on music were wrong as I have found this volume to be both sad and amusing as young Kosei Arima finds himself in a dreary monotone world after his mother This series is rated Teen and deals hardships including death and also has a little violence so consider these things before reading it but know at least from the 1st volume I believe there might be hope later on in the series. I'll be honest I wasn't 100% sure about a "musical" manga but I will admit my preconceived notions about a manga based on music were wrong as I have found this volume to be both sad and amusing as young Kosei Arima finds himself in a dreary monotone world after his mother died from a sickness. As a child star in the classical piano circuit Kosei was drilled relentlessly by his mother to be as perfect as can be so he can live out her dreams to go to Europe and be a famous musician. Instead after her passing he lost the ability to hear the notes while he played on the piano so he ended up giving it up and settled for the world he saw devoid of colors. Pretty sad right? Reading this feels like listening to a talented singer with great voice, who unfortunately keep making the same mistakes and hitting the wrong notes over and over again until the whole performance is kind of ruined. Er, random musical analogy aside, there's actually a lot that I like from this manga's set-up. For starter, the fact that the the main characters are middle-schoolers/pre-teens, which I don't see very often in manga. It's a great period when kids are mature enough to start exploring Reading this feels like listening to a talented singer with great voice, who unfortunately keep making the same mistakes and hitting the wrong notes over and over again until the whole performance is kind of ruined. Er, random musical analogy aside, there's actually a lot that I like from this manga's set-up. For starter, the fact that the the main characters are middle-schoolers/pre-teens, which I don't see very often in manga. It's a great period when kids are mature enough to start exploring complicated feelings and emotion, while still retaining the sense of childhood innocence lacked by high-schoolers. Naoshi Arakawa's art hits similar kind of sweet spot by combining the intensity of typical shounen art and sensitivity of shoujo style, creating a signature look that's both powerful and very easy on the eyes. He's very, very, good at paneling and impactful framing, too. Someone once said to me that "a comic/book about musician is kind of useless because you can't hear the music", however, Arakawa's art has enough power and details that the characters absolutely resonate with me during their performance scenes. I like the main character, too. Arima Kousei is an unusual protagonist for this type of comic, quieter and more perceptive than your typical lead. Most importantly, his mental block makes for an intriguing internal conflict and a very realistic depiction of a real life issue. Physical abuse by a parent figure is a serious thing, and watching a fundamentally good kid struggle to come to terms with it and overcome the guilt he shouldn't even bear is simultaneously gut-wrenching and inspiring. It's also very interesting to see Arima's past as a child prodigy, as well as the bond he formed with his two lifelong rivals. .....Now, about those "wrong notes". In addition to music and internal struggle, there's a lot of comedy and romance in April. To be frank: they don't work at all. The comedy first: nowadays I've been bothered a lot by the sense of humor in many shounen/shoujo manga, as it often try to pass off abusive, sexist, and/or problematic behavior as something 'cute' or 'funny'. April's main joke is to have Arima routinely abused (physically and emotionally) by the two main female characters, which is not only unfunny, but becomes extra disturbing when you consider the boy's background. Like... I dunno girls, your friend there was severely abused in his childhood, maybe you shouldn't kick his kneecap/throw his head with softball/choke him with recorder/emotionally blackmail him? It happens too often to be coincidental, which leads me to suspect that Arakawa-sensei really think that brute force and aggressive girls are the best therapy for abuse-induced trauma. I'm not an expert on psychology... but yeah, that doesn't sound right at all. The problem with the comedy ties directly to the romance one, since the aforementioned two girls are also Arima's love interests. It's basically a tiresome love square, with the second boy never becoming significant or memorable enough. I couldn't care less which girl Arima ends up with, as they're both selfish, petulant, and manipulative. Teenagers are never perfect beings, I know, but these girls are just too damn unsympathetic. The occasional melodrama makes it even worse, as some of the characters like to suddenly break out of character and wax some purple prose. Imagine watching kindergarteners have a childish fight, and seconds later quote Shakespeare out of the blue-the effect is as jarring as that. (there's another girl character that I actually like, just because she's much wiser and more mature than everyone else. Unfortunately, her only role is to be the thankless Best Friend/Adviser character). The music performance scenes are the biggest strength of the series, but they're not entirely free of problems either. As I've mentioned above, Arakawa's art is more than good enough to convey the emotional state of the musicians during their performance, but he also frequently have a bunch of random people in the audience providing unnecessary amount of corny commentary. "That boy looks nervous!" "Ooh the melody truly comes from her heart!" "I could feel the emotion coming!" Yes, yes, please shut up, Random Audience #3. Dari awal kemunculan judul ini di jadwal sneakpeek, saya selalu bertanya-tanya: "Bagus kah komik ini? Bagaimana plotnya?, dll". Lalu saya nyari info di forum-forum atau kanal online lainnya. Sebagian besar ngasi rating yang bagus, cerita bagus, development chara dapet, feel-nya dapet, dll. Akhirnya saya tertarik untuk beli (kebetulan m&c! lagi ada promo, jadi... langsung lahap). Setelah baca... err, apa saya terlalu berharap tinggi sama buku ini? Plotnya terasa menyebalkan, tokoh-tokohnya pun lebih menyebalkan dari plotnya (dan saya hampir ngebelah buku ini jadi dua gara-gara itu). Arima, yang setelah ibunya meninggal, tidak bisa 'mendengar' suara piano. Bocah gagal move-on yang terlalu berkutat sama masa lalunya, dimana ini terasa menyebalkan sekali! Cewek rambut hitam, yang namanya males saya ingat gara-gara terlalu ikut campur sama urusan Arima (bagiku terlihat begitu). Bukannya ga boleh sih, dan saya juga tau maksud baikmu, tapi... entah kenapa rasanya menyebalkan sekali. Lalu cewek biola (ini namanya juga saya males ingat)... sifatnya brutal untuk instrumen yang dipegangnya. Seharusnya kalo main biola ya sifatnya dibuat lebih elegan. Lain lagi kalo instrumen yang dimainkan drum, kalo sifatnya agak brutal ya gapapa saya ngerti kenapa bisa gitu (ini masalah selera ya). Yah, nilai plusnya sifatnya ini menyeimbangi karakter Arima yang terlalu adem ayem.. Kalo ga ada tokoh ini, cerita ga bakalan jalan kayaknya. Oh my God... This manga was a big feels trip. It was all about friendship, love for music, love for mother, love for each other, all kinds of loves. Determination and your goals in life, living to the bits..everything was beautiful and symbolic. 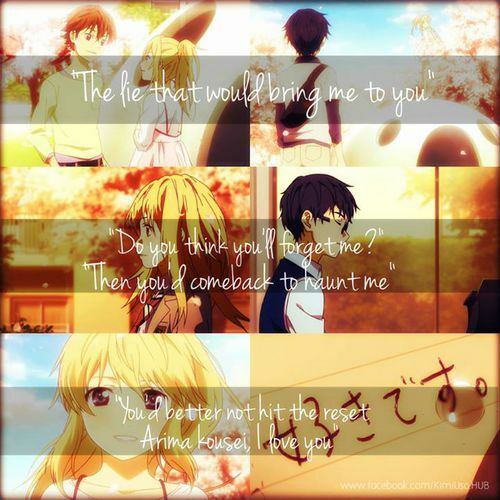 I loved Kaori, Kousei, Tsubaki, Watari, Emi, Takeshi..and others. I loved how interesting their characters are. I loved sweet love between Kaori and Kousei. Sweet love of Tsubaki. I loved the meaning of "love " here. I have so much love for this series, especially because it is all about musicians, and specifically a pianist. I have played piano and taught piano lessons for more than 20 years, and anything having to do with music is near to my heart. I love how the musicians in this manga are portrayed, full of the love of their artform, full of creativity, and sensitive to beauty in the world around them. 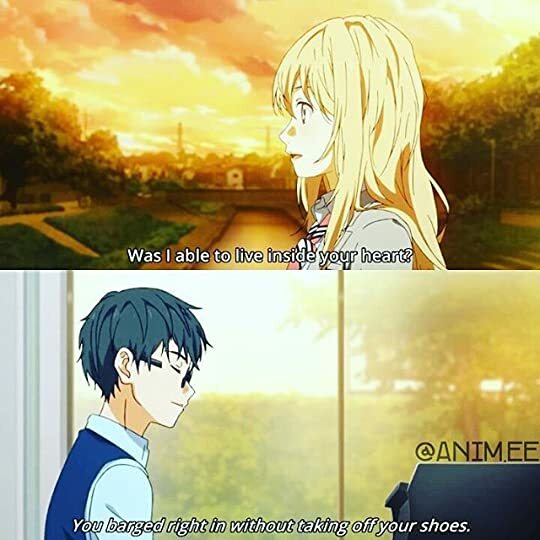 Kaori and Kousei are such wonderful characters! I love the whole gang of friends, and their individual s I have so much love for this series, especially because it is all about musicians, and specifically a pianist. I have played piano and taught piano lessons for more than 20 years, and anything having to do with music is near to my heart. I love how the musicians in this manga are portrayed, full of the love of their artform, full of creativity, and sensitive to beauty in the world around them. 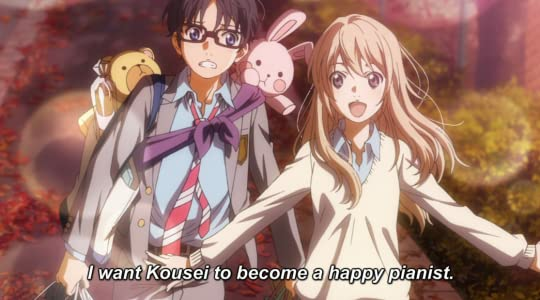 Kaori and Kousei are such wonderful characters! I love the whole gang of friends, and their individual stories. I love how they support and care for one another, always cheering each other on through difficulties. I love this story. So many beautiful passages. It is possible that I love this manga because I'm a fan of the anime, so it's hard for me to separate the two. But I did think this volume had a lot to offer and had some genuinely beautiful art and sweet thoughts behind it. The anime seems to be a direct adaptation, which is a neat discovery. Can't wait to read volume 2! Holy Molly this is good! Depois de ter visto o anime quis tanto ler o mangá. Primeiro de tudo senti falta da música, o que era de esperar mas pensei que poderia ler sem me incomodar, mas incomodou só porque já vi o anime *buh*. Por isso bem tive que o ler a ouvir musica clássica, e foi 5 estrelas *hihih* (também podem ouvir o Epic San no youtube) Mas não interessa, é super interessante na mesma, e vale a pena ser lido porque ensina muita coisa importante. Untitled-1 copyKousei sempre foi um grande pianista quando era peq Depois de ter visto o anime quis tanto ler o mangá. Primeiro de tudo senti falta da música, o que era de esperar mas pensei que poderia ler sem me incomodar, mas incomodou só porque já vi o anime *buh*. Por isso bem tive que o ler a ouvir musica clássica, e foi 5 estrelas *hihih* (também podem ouvir o Epic San no youtube) Mas não interessa, é super interessante na mesma, e vale a pena ser lido porque ensina muita coisa importante. Untitled-1 copyKousei sempre foi um grande pianista quando era pequenino, porque a mãe assim o obrigada, embora ele tivesse o chamado “dom” para o piano. A sua mãe que também era pianista obrigava-o quase sempre a estudar e a ensaiar, mal podia ir brincar, não se podia magoar nas mãos e tristemente batia-lhe nos braços cada vez que se enganava, no entanto Kousei transformou-se num rapazinho que era extraordinário a tocar piano. Toda a gente o admirava, até ao dia que a sua mãe morreu, ou pelo menos até essa altura, em que deixou de conseguir ouvir o piano, no inicio tudo bem mas passado um pouco as notas eram abafadas e deixava de as ouvir, ou seja começava a tocar tão mal e fora do tempo. Daí a ter desistido completamente dos concursos e tudo mais. A história muda completamente quando Kousei é quase obrigado, pela sua melhor amiga Tsubaki a ir a um encontro a 4, mais ou menos isso, porque a amiga dela,Kaori, quer .conhecer Watari, por gostar dele, então ela não quer ficar sozinha com os dois e obrigada Kousei a ir com eles. Mas não passa de uma armadilha para obrigar Kousei a ir a um concurso de violino onde Kaori vai participar. Mas o encontro de Kousei com Kaori é excelente, e é anterior a Tsubaki e Watari chegar, ele vê um sapato e umas meias penduradas e apanha-as para entregar a quem quer que as tenha perdido. Mas ao ouvir uma musica encontra-a no parque a tocar toda feliz. Supostamente para chamar os pombos para as crianças. Mas é a maneira como ela toda que lhe chama a atenção, dizendo que a maneira como ela toda despromovida de pautas e isso é como se o mundo estivesse a brilhar. É algo que se vai notando no mangá, devido a ausência de sons, mas com referencias ao que estão a tocar, no entanto dizem muitas vezes que a musica que tocam criam cenários, felizes ou tristes. 1Kousei fica imediatamente apaixonado por Kaori, não só pela sua beleza mas também pela sua maneira de ser. Embora a ache que muitas das vezes é resmungona, mal educada e impulsiva. Que é o que vai notar na sua audição no concurso, onde não segue a pauta tal e qual como deveria mas dando o seu toque pessoal. Chegando a conclusão que ela não quer saber do concurso para nada, o que ela quer é ser ouvida e que gostem do que ela toca. E toda esta paixão que ela tem pela musica que toca, comove Kousei, pois ele também gostava de voltar a sentir isso, mas acha que é impossível. Ah! De salientar que Kousei nesta altura vê Kaori como a rapariga que gosta do seu melhor amigo. E Watari é um mulherengo, mas é seu amigo, e ele não pode fazer nada para mudar isso. E é por isso que Watari anda de um lado para o outro e nem se apercebe disso. Num dia que teve de ir sair com outra rapariga, Kousei volta para casa sozinho, mas a caminho encontra Kaori, que lhe pergunta por Watari. Kousei mente e diz que ele teve de ficar na escola e Kaori nomeia-o então como seu substituo e os dois vão a pastelaria lanchar, devido a uma série de eventos Kaori diz então que quer que Kousei seja o seu acompanhamento no concurso de violino. Pois embora ela não tenha ganho para passar a etapa seguinte, foi escolhida pela publico para continuar e é isso que quer fazer, mas tem de arranjar alguém que toque piano. Kousei sabe que não consegue ouvir o piano, mas devido a insistência dela, lá aceita, ou é obrigado a aceitar. Untitled-2Toda a gente fica admirada por eles começarem do inicio, e felizmente para Kousei ele consegue ouvir o que está a tocar e é excelente, porque toda a gente adora. Chamando como uma competição entre os dois mas é uma combinação muito boa! E assim começa uma nova aventura de Kousei com a rapariga que gosta do seu melhor amigo. O grande problema de Kousei é que teve um acontecimento que o marcou muito, para além da morte da sua mãe, as ultimas palavras que lhe disse foram muito feias e é isso que o atormenta, quando está ao piano a imagem da sua mãe na cadeira de rodas e com oxigénio vem a sua mente e as palavras que ela lhe diz assombra-no. E esse o teu castigo, a tua penitencia. Pelo menos é o que ele ouve, não que ela tenha dito mesmo. Até que ponto temos de parar de correr atrás do passado para começar a olhar para ver o futuro brilhante? Isto é uma pergunta fundamental neste mangá, e é explorada de uma maneira excelente. Kousei luta muito interiormente e apercebi-me disso pelos seus pensamento e maneira de agir, embora seja muito dramático, é a maneira como ele se sente. Kaori vem ajuda-lo e logo de imediato sabe-se que tipo de rapariga é, muito vivida e cheia de amor, diz as palavras certas quando Kousei precisa de as ouvir, e mostra que ser impulsiva e feliz com o mundo não tem nada de mal, mesmo quando o mundo está contra nós. Foram duas personagens fantásticas que não pude deixar de gostar por mil e uma coisas. Untitled-1Um pensamento que artistas, não só musicais, vão entender é que nascemos assim, e por muito que nós tentamos mudar isso não dá, simplesmente não dá. Nasce connosco e como criadores temos sempre a necessidade de criar, de explorar e mostrar ao mundo o que sentimos, mesmo que ele não nos queira ver ou ouvir. Estar tudo fora do corpo é como nos sentimos melhor. E é por isso que tanto como Kaori como Kousei tocam, não só para concursos mas sim para serem ouvidos, mostrar aquilo que sentem e o que lhes vai na alma. E o mangá foca bem isso, que é uma realidade. O amor e o sentimento que tem de libertar não é necessariamente uma escolha mas sim uma maneira que temos de libertar e de exprimir. Mais uma vez Arakawa vai directamente ao assunto, logo no primeiro volume é capaz de nos meter viciados na leitura, e não arrasta a história de forma irritante mas mantém o suspense (tem de facto um factor que não falei em cima de propósito). Pois há logo no primeiro volume um mistério que deve ser tomado em atenção que liga directamente ao titulo do mangá, A tua mentira em Abril, já que começa em Abril. I saw the anime of this series when it came out on Netflix. It was totally worth it. The art is absolutely stunning! So you can understand why I was excited to read the manga after being moved by the anime. 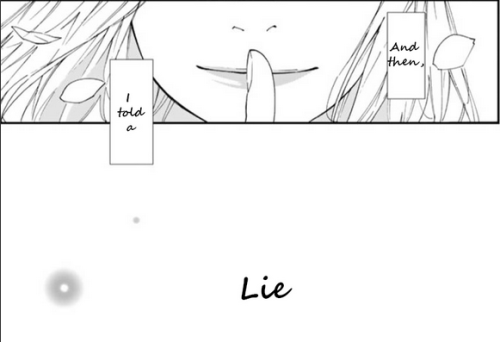 This is only the very, very beginning of the series where Kosei first meets Kaori. Their relationship is essentially what whole series revolves around. One of the most important elements for them is music since Kosei is a concert pianist and Kaori is a violinist (though she can and does play o I saw the anime of this series when it came out on Netflix. It was totally worth it. The art is absolutely stunning! So you can understand why I was excited to read the manga after being moved by the anime. This is only the very, very beginning of the series where Kosei first meets Kaori. Their relationship is essentially what whole series revolves around. One of the most important elements for them is music since Kosei is a concert pianist and Kaori is a violinist (though she can and does play other instruments as well). 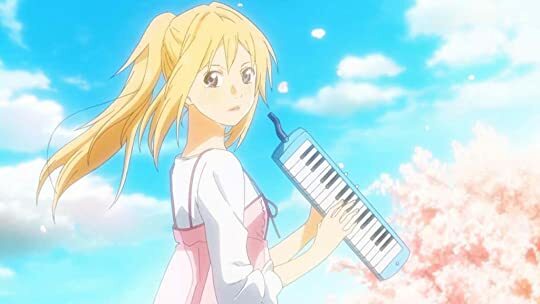 Kaori knows that Kosei is a famous concert pianist because he was a child prodigy so she wants to have him accompany her when she plays for a competition. He tells her he can't because due to ptsd and depression, he can no longer hear the notes that he plays. This has a lot to do with his mother who harshly pushed him to learn how to play expertly as a small child. He has given up piano playing but still writes music in his spare time. Kaori, after learning this asks him to accompany her so that he will help himself get better by performing in front of a crowd again. This is a story about healing and moving on from the past- friendship being a huge player in this. It's actually a pretty dark story at points. Probably will be especially in later volumes, if the anime and manga are similar. I'm not spoiling the ending since I already know it. There are a few major plot twists coming up. 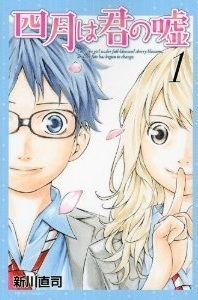 The first volume ends when Kosei and Kaori are being taken by their friends to the competition where Kaori is competing for a championship for violinist. If you like manga (shojo), anime, YA, romance, or stories about music/musicians this manga series might be interesting for you. I rated this volume 4 stars. I also suggest the Anime which I think is still available on Netflix in English and Japanese. Your Lie in April foi um mangá que recebi de presente da Lytta Miranda no ano passado, junto com o forte Vitamin - e confesso, não sabia muito bem o que esperar dele. Claro, esta é uma história sobre música clássica e um jovem prodígio que não vê mais a beleza de seu dom, mas quanto mais eu penso, mais eu vejo que não é só sobre isto. Antes de mais nada, o mangá é sobre se reencontrar depois de não ver mais sentido naquilo em que você é o melhor. Existe uma triste ironia nisto tudo - mas já nos p Your Lie in April foi um mangá que recebi de presente da Lytta Miranda no ano passado, junto com o forte Vitamin - e confesso, não sabia muito bem o que esperar dele. Claro, esta é uma história sobre música clássica e um jovem prodígio que não vê mais a beleza de seu dom, mas quanto mais eu penso, mais eu vejo que não é só sobre isto. Antes de mais nada, o mangá é sobre se reencontrar depois de não ver mais sentido naquilo em que você é o melhor. Existe uma triste ironia nisto tudo - mas já nos primeiros momentos percebemos qual foi o catalizador que provocou o bloqueio em Kousei. Então, ele conhece Kaori, e um menino que vê tudo a sua volta em preto em branco se choca com uma garota que é apaixonada pela vida, e neste instante, Naoshi Arakawa nos presenteia com belas passagens - algumas cenas de uma poesia visual ímpar, conseguindo transmitir nas ilustrações todo o sentimento do momento. Entretanto, está claro que a história terá mais caminho pela frente. Kaori é uma personagem que, mesmo cheia de vida, demonstra uma fragilidade que está claro que existe uma gênese. Foi interessante a forma como Naoshi não demonstrou isto de forma óbvia até o último instante - e, olhando em retrospecto, percebemos que isto estava lá, desde o começo. Além do mais, foi divertido a forma natural como houve algumas quebras de expectativas, que estavam me incomodando no começo, mas foram embora com o tempo. Your Lie in April is about 2 musicians, A pianist and a violinist, and their performances and interactions together. Both Kosei and Kaori are round characters with extremely rich back stories that allow you to connect to them. It is done in the manga art style. 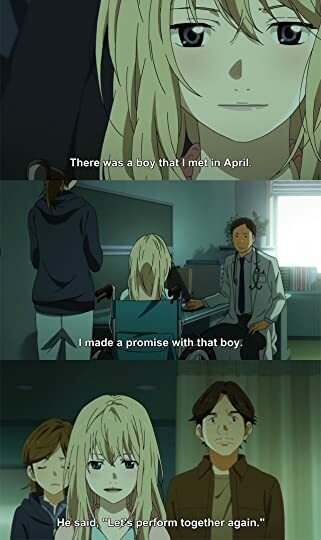 Your Lie in April is a story that really allows you to connect to the characters, and feel genuine emotion for them. Definitely a must read. I'm aware that this series takes a tragic turn at some point, but this volume is pure romantic comedy. It's fun, and cute, and might get you interested in classical music, especially live performances! Share it with the aspiring musician in your life. This was January's pick for the Adelaide Ladies Comic Book Club. An easy read, but it didn't blow me away. Enjoyable enough that I might check out the anime, but probably not enough to keep me reading the manga.